After the successful opening of its initial Cascade Basin development in 2013-14, Pats Peak has accelerated work during the 2014 off season to open additional terrain. 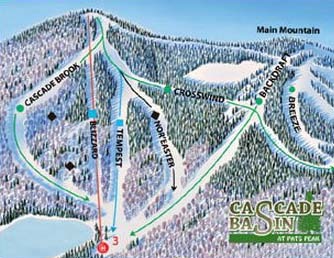 Located to the east of the main mountain, Cascade Basin debuted with three novice-intermediate trails and a triple chairlift on December 19, 2013. The trails feature full snowmaking coverage, but no night lighting. Initial 2014 plans were for one additional trail to open, however management decided to cut a total of two new trails (a novice trail named Cascade Brook and a bump run named Nor'Easter), both of which have snowmaking capabilities. In addition, the Katabatic lift line trail has been renamed to Blizzard.